Wish I had Known that he wanted a place of that Kinde Think he might have got the Chaplaincy of the 7" we have no Chaplin & have not had Since Teatic Resigned. I have not heard a Sermon Since I left Home Excepting (one high Sermon at Prospect.) The two Last Sundayes we have marched all day. do not Know whither we will march tommorrow or not but I hope we will get to rest. You must excuse this disconnected & uninteresting letter for I am very busy & Bothered So much by Officers Calling on me for papers of different Kindes That I hardly Know what I am doing. 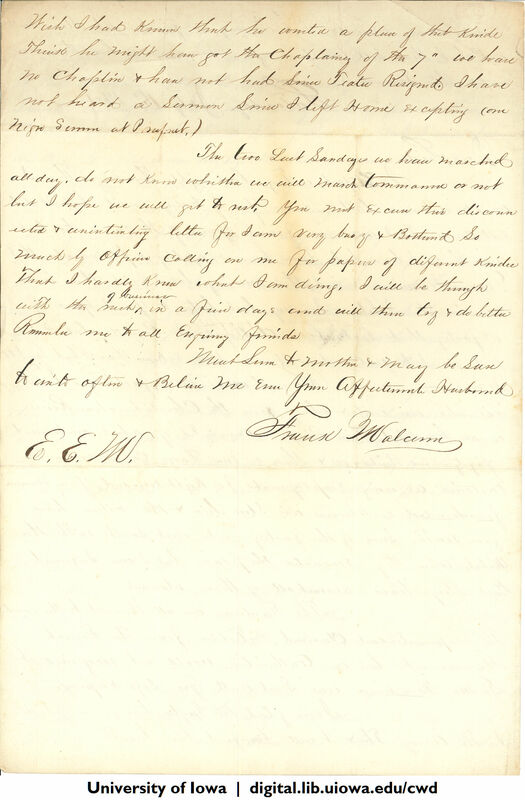 I will be through with the rush of business in a fiew days and will then try & do better Remember me to all Enquiring friends Much Love to Mother & May be Sure to write often & Believe me Ever Your Affectionate Husband Frank Malcom E.E.M.